I love to sew. I love everything about sewing – the fabrics, the threads, the little tools like the seam ripper and seam gauge, the machine and all its stitches, the ironing, the scissors. I’ve been sewing stuff together since I was eight or nine years old, thanks to my mom. I’ve made clothes for me, clothes for my son, and clothes for whatever husband I had at the time. I’ve sewn curtains, dog jackets, market bags, pillow covers, and doll clothes. I’ve repaired and mended more pairs of jeans than I can ever recall. I’ve stitched together prom dresses for other people, Hawaiian shirts for anyone who wanted one when they weren’t “fashionable” and bell bottoms before they were “cool.” I’ve even made a quilt or two. Or maybe three. Who’s counting? 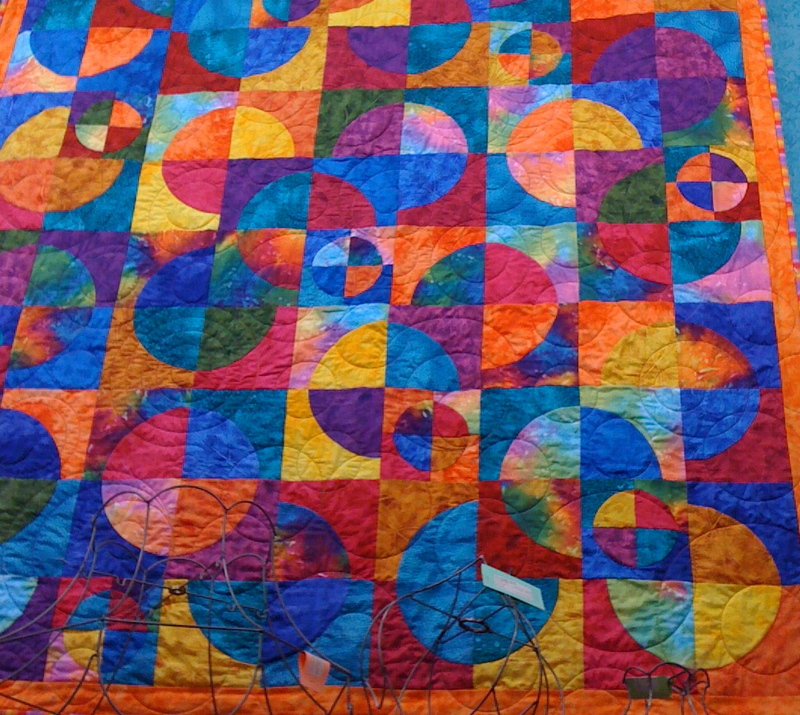 But I’ve never been what I would call a “quilter.” Someone who makes big bed-sized cover things that have bazillions of little pieces all sewn together and then top-stitched in fancy (or even not so fancy) patterns. Someone who makes wall hangings out of of fabric pieces that look like paintings until you get up close and see that they’re actually little bits of material put together in a way that makes you think somebody painted them on a canvas with a brush instead of sewing them together with thread. So I have a little story to tell you about a quilting adventure I went on recently. 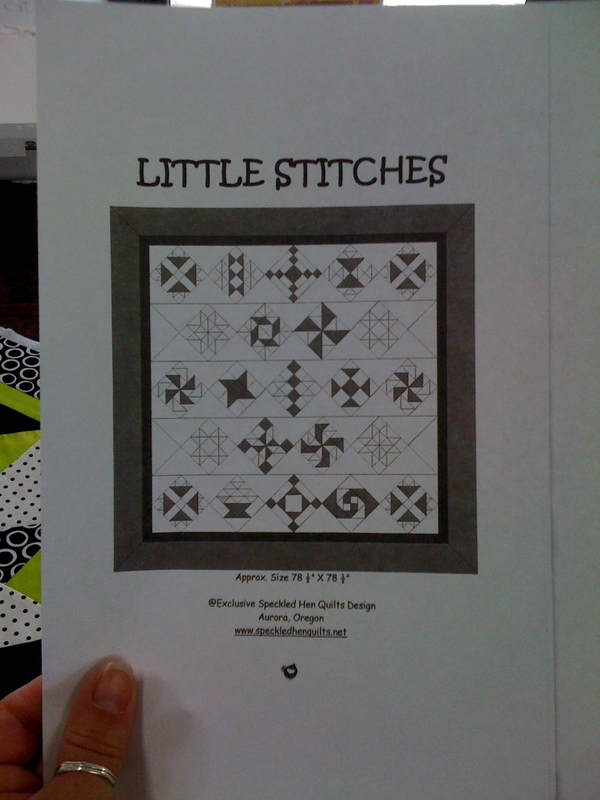 A couple of weeks ago, my friend, Tricia, and I spent a few days doing what’s called a “quilt shop hop” here in the general area south of Portland, where we visited twenty quilt shops, got our quilting “passports” stamped, and picked up a piece of paper with a quilt block pattern on it. That’s over-simplifying it a bit, of course, but that’s the general gist of the “shop hop.” We split up the “hopping” over three different days because the area traveled was fairly large – it stretched out a little over a hundred miles long and about forty miles wide as the widest part. Now, on to the “hop” part. 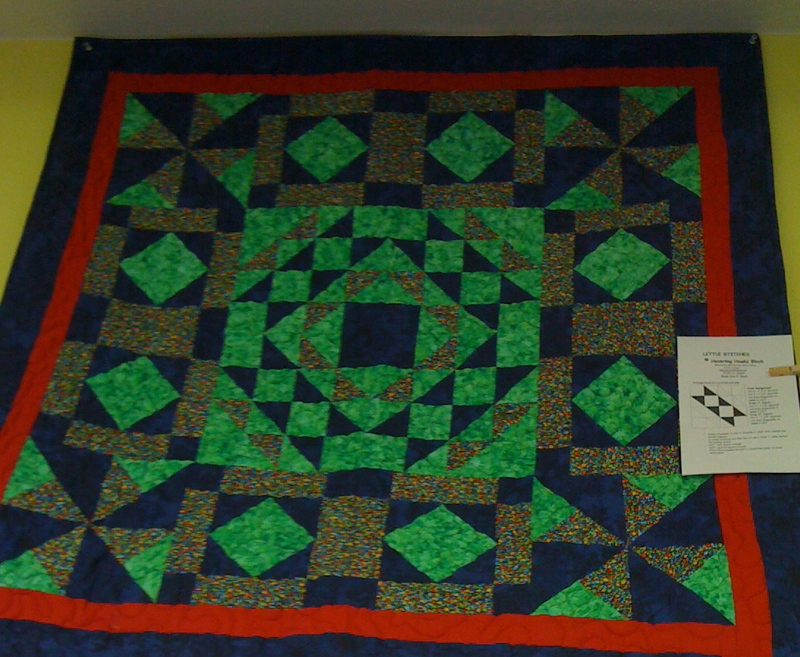 It was called the Little Stitches Quilt Shop Hop, and was organized by a quilt shop owner in a nearby town, using pattern pieces that she had designed herself. We decided to start our adventure at the local quilt shop in town, where we picked up our “passports” along with a descriptive flyer that had a sorta-kinda-map in it, and began planning our routes around what was close together (not much), where we could stop for lunch (a serious concern when traveling the country back roads), and which towns had the best options for “other” shopping (just about anywhere that had more than a quilt shop in town). As already mentioned, we decided to split the twenty stops into three days worth of “hopping” so as to maximize the opportunities for lunch out and potential “other” shopping. Oh wait. We were splitting it up because of the amount of territory covered. Gotta keep my story straight. 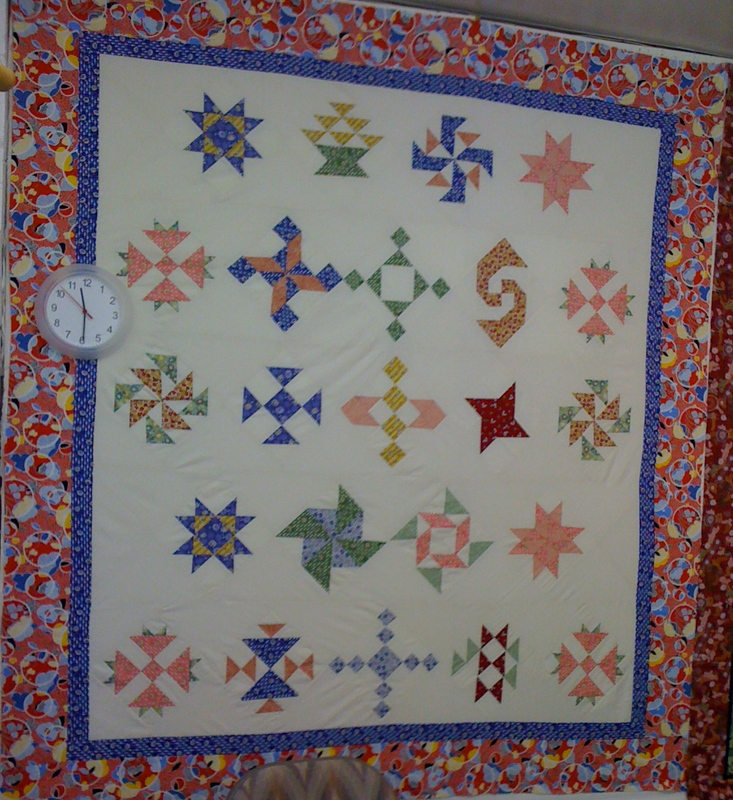 Each shop was responsible for handing out either a block pattern or a finishing page, as decided by the woman who organized the whole thing, and for the most part, the shops who had block patterns also made some kind of quilt-y thing using “their” pattern – everything from big, bed-sized quilts to little table-top cover thingys. 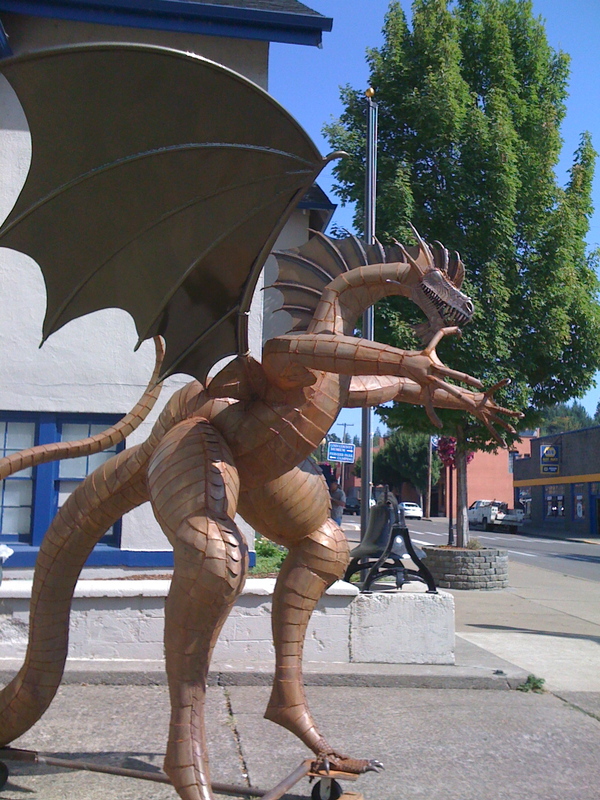 Most of the shops were in small country towns somewhere off the main drag of I-5 which cuts through Oregon north to south, so we drove the back roads as much as possible – so much easier on the eyes! The shops were full of home-y little quilts and not-so-little quilts, friendly people and not-so-friendly people (although the cranky ones were the exception, not the rule) and all of them were chock-full of gorgeous fabrics in every imaginable pattern and color, and books to spark any dim spot of the imagination that hadn’t yet been lit up by the displayed quilts or the yardage stacked up below and around them. What a feast for the eyes and fingers, seeing all those colors and touching all those textures! 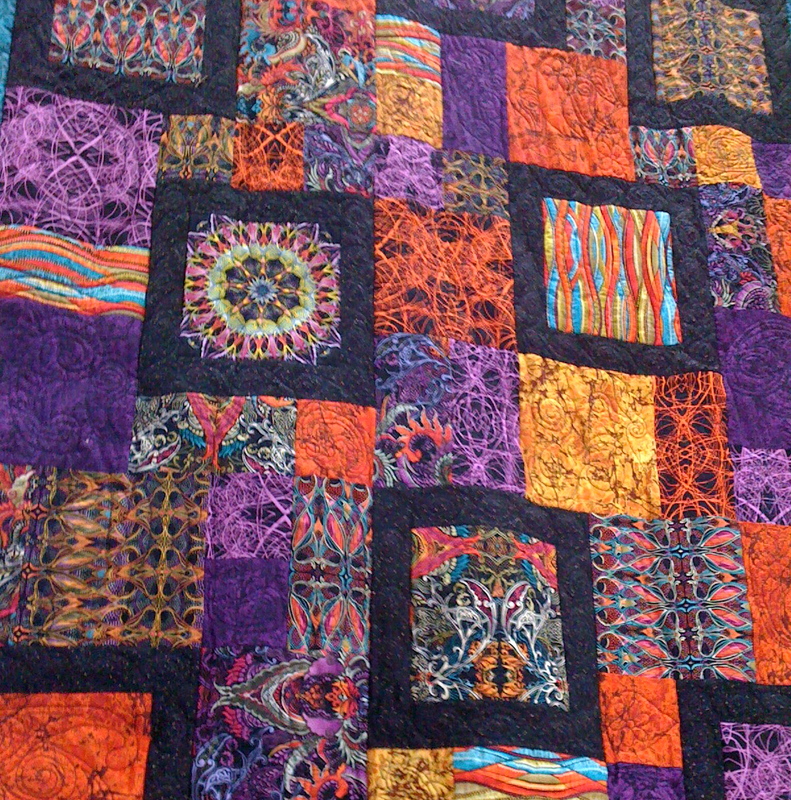 Quilts to inspire you, to snuggle up in, to cover the big ugly hole in your wall, to put under your dinner plate at the table. I could surround myself with fabric and be happy as a clam! (Are clams really that happy? I mean, we always seem to assume they are with that little cliché-y statement.) Oh, wait, I have done that, surrounded myself with fabric! I still have scraps of stuff left over from projects I sewed decades ago. 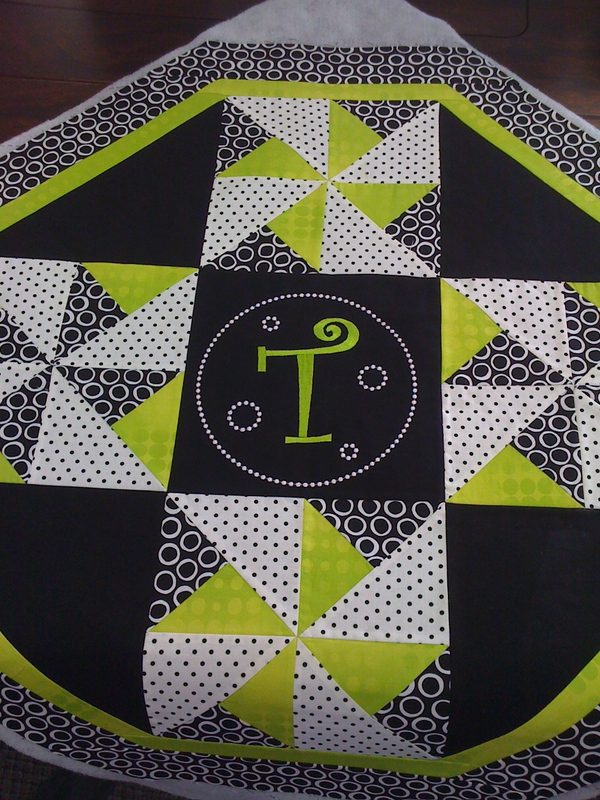 I still have yards of material I bought “just because.” I still have crates of fabric stored in Tricia’s workshop for the day when I leave Li’l Homey behind and find a house to settle down in – and start quilting. Oh no! I AM a fabric hoarder! Ok, back to the shop hop. Along the way, we visited antique stores that looked inviting, stopped to take photos of huge winged dragons perched on the side of the main road through whatever that little town was we were driving through, ate lunch at little cafés that promised good food, window-shopped in country stores, and talked to more people during that three days than we usually do in three weeks! It was truly a fun adventure, driving through the back country, passing beautiful flowers and trees, seeing cow after cow, herds of sheep and goats, and way more horses than you can imagine – we even saw a mama deer and her baby in someone’s front yard! Once we got our passports stamped at all twenty shops, we turned them in to our local shop. When the shop hop ends, the shop owners will all get together and choose a grand prize winner who will get a brand new Brother sewing machine, and then they’ll choose forty more winners who will receive prizes that each shop has donated – $50 and $100-value baskets or gift certificates or other prizes. 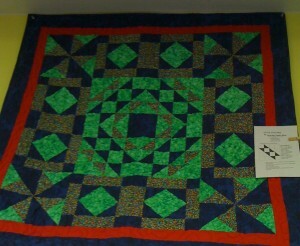 Love the work in this quilt! 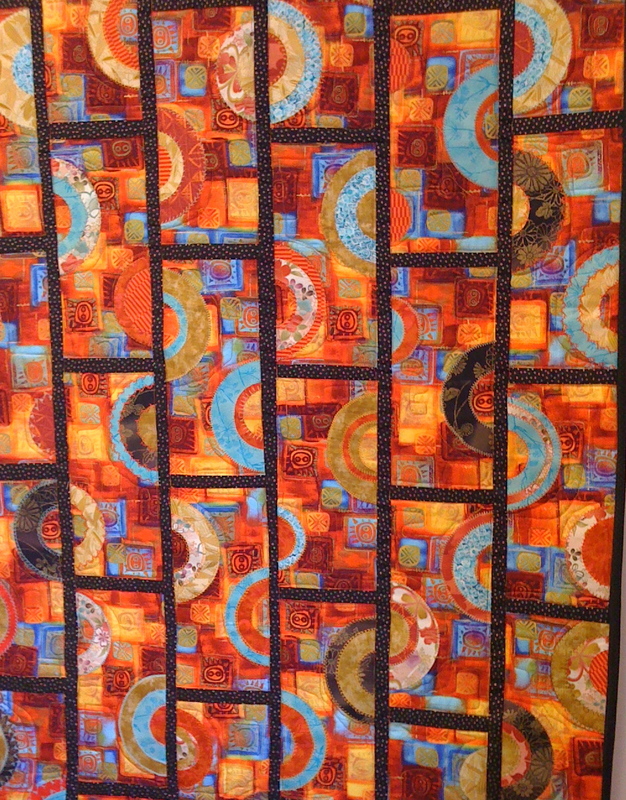 Here’s one more gorgeous example of a quilt hanging in a shop somewhere in Oregon – isn’t it fabulous? If you’ve ever wanted to sew something or make a quilt, don’t waste any time – run right over to your local quilt shop and sign up for some sewing lessons or a “quilt block of the month” quilt and get going… now. You, too, could have one of these beautiful pieces of art in your home – don’t put it off! You can do it! PS. It would be nice if Tricia won the new machine because she’s still sewing on her grandmother’s machine from way back when. (Didn’t she bring it with her on the Mayflower?) Cross your fingers for her! We’ll find out in a week or two who won and I promise I’ll let you know. Lois August 29, 2012 March 1, 2015 Day Trips, It's All About the Trip, Now What? It was such a fun adventure, Lorna! I had no idea that such things even existed, these shop hops. Apparently there’s an Oregon-wide one that has 72 shops and is divided into regions of the state – it runs in October this year. What a hoot! I’d love to meet your friend – maybe one of these days our paths will cross. And thanks for “seeing” Tricia with the machine! I love following your adventures Lois! You always find new, unusual and off the beaten path things to do. What a great way to spend three days and I am right there with your priorities – girls gotta eat! Glad you are feeling better. Speaking of eating – let me know when you are up for dinner again. We can try someplace new. Nancy, I’ve always been amazed at the sheer number of things to do in Oregon and Southwest Washington in the summer! Wow! No way to keep up with all of it! Our three days were spread out over the 10 days of the shop hop and Tricia did the driving while I bought the lunches. We even took her two little ones (3 and 4) with us on the second travel day – what a disaster that turned out to be! Never again! I couldn’t even write about it; it was a flippin’ nightmare… I’m still recovering from that day.